Photos taken in Cornwall, a fine Saturday in October. Sea Campion (Silene maritima). A coastal plant, here at Perranporth airfield. Also found inland on ground polluted by heavy metals, such as the lead spoilheaps at Priddy Mineries. (below) Western Fumitory (Fumaria occidentalis), a Cornish speciality. Probably. I admit I didn't know what finer details to look for, but Eb told me it was a local plant, and it's certainly very robust. (below) Corn Spurrey (Spergula arvensis). Like the previous plant, seen in fields of Savoy Cabbage. A handsome street tree in the UK, noticeable at this time of year, until the birds eat the fruit. It is native to the Baltic region, including southern and central Sweden, approximately in what is known as the "oak-region", to distinguish it from the vast areas of coniferous forest that cover the rest of the country. In Sweden it is often planted in wind-alleys and along the coast, being notably windfirm. Its popularity in the UK has more to do with its resistance to air pollution. 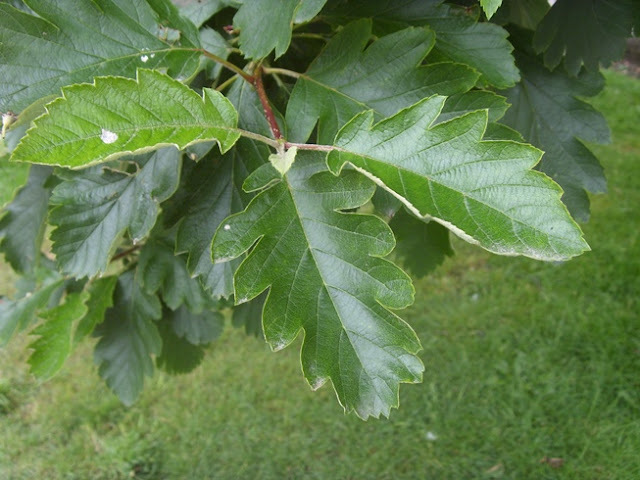 It may have arisen after the last ice age as a natural cross between Sorbus aria (Whitebeam) and Sorbus aucuparia (Rowan) - a similar origin, probably, to some of our rare endemic species (S. leyana, S. anglica, S. minima, S. arranensis), though these are mostly shrubs. The Swedish name for the tree is "oxel", of unknown derivation, but perhaps from the same root as other ancient fruit-words (such as "akarn" (ollon - acorn)) - the word "oxel" would therefore have originally denoted the fruit only. - as per apple, chestnut, and many other trees. 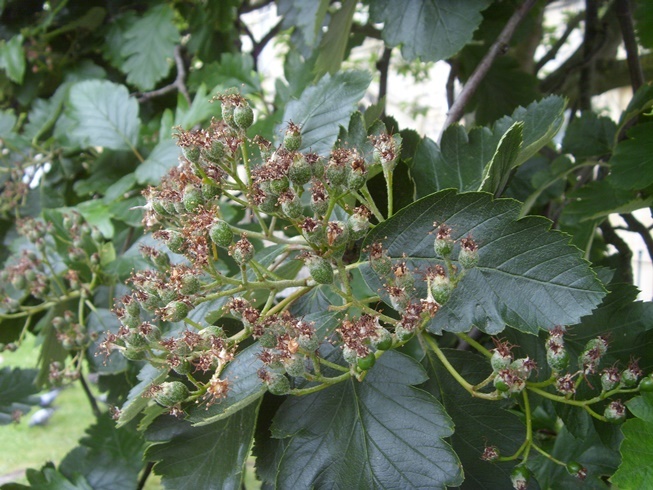 The name "intermedia" refers to the distinctive leaf shape, intermediate between the entire whitebeam and the pinnate rowan. Though obviously a Sorbus, the shape strikes me as vaguely oak-like, too. The fruits contain two ovules, which potentially form two pips. Most of the fruits I examined contained only a single pip. The wood was formerly used to make rulers - inch-rulers in those days (Swedish "tum") - and by woodcarvers to make spoons, spokes, axles etc. Appendix - a couple of photos from 14th June 2015 (it's the same tree, in the little park at Lower Borough Walls, Bath). It was the absence of a moon in the evening that made Jupiter shine so brilliantly last week. (On Sept 21st Jupiter was at its brightest for 47 years.) But anyway, here are some moon observations from the Brief History. Wordsworth wrote the Lucy poems while in Germany. The moon sets every day, but we don’t often see it do so. Canonical literature, so loquacious about sunsets, virtually ignores the existence of moonsets, except in this poem. We most usually notice the moon when it’s full, and we draw each other's attention to the big (or apparently big) moonrise that occurs soon after sunset. A moonset near the full, however, would occur near dawn, the coldest part of the night; when (at least in temperate climes) we tend to sleep on, and even if we happen to be out and about the spectacle of moonset is probably lost in the mist. The little white ghost of a waning moon is hardly ever noticed when it sets during the hours of daylight. The most impressive moonset I've seen was a lazy moon on a cold winter night which became yellower and bigger, and finally just after midnight a smoky red as it dropped into the west. So rarely have I noticed a moonset in my fifty years that it hadn't really occurred to me that the setting moon must often go through the same colour changes as the setting sun. If the moon is going to set earlier in the evening, not too many hours after sunset, it must be a brand-new sliver of a moon, which is probably not what most readers envisage while they're reading Wordsworth's poem. Yet evening, we imagine, is when the action takes place. However, the hill makes a difference. After crossing the “wide lea”, with the moon spreading its light, the lover starts to ascend rather sharply, and “Lucy’s cot” is on a ridge. Thus the moon could seem to “set” when still comparatively high in the sky. Wordsworth had often noticed the sharpness of Lakeland’s high night-horizons, and e.g. famously written of how “the stars moved along the edges of the hills”. In the opening pages of Jane Eyre, Charlotte Brontë says (of a Bewick engraving): "I cannot tell what sentiment haunted the quite solitary churchyard with its inscribed headstone; its gate, its two trees, its low horizon, girdled by a broken wall, and its newly risen crescent, attesting the hour of even-tide." This is an understandable error - a crescent moon rises either early in the day (if waxing) or late in the night (if waning). The sharp crescent moon in the evening is not newly risen - in fact is soon to set - it is only newly remarked. As for her assertion that the crescent implies even-tide, she's probably right about that - so long as it's a waxing moon (horns pointing to the left). I ought to look up the Bewick engraving she's talking about, I suppose. In practical terms a moon in an engraving is always going to be low on the horizon, because otherwise it would be outside the frame. And at the begining of Chapter 5, the young Jane Eyre is leaving Mrs Reed's house for Lowood. "Five o'clock had hardly struck on the morning of the 19th of January, when Bessie brought a candle into my closet and found me already up and nearly dressed. I had risen half an hour before her entrance, and had washed my face, and put on my clothes by the light of a half-moon just setting, whose ray streamed through the narrow window near my crib." Well, wrong again! A waxing half-moon would have set at midnight; a waning half moon would still be on the rise. But a moon that sets some time between 5 and 6 in the morning (as we are later informed) would have to be almost a full moon - say, 90%. Here, and later (e.g. Chapter 9), Charlotte Brontë registers what a significant aid moonlight was for getting things done in the hours of darkness. There was more reason in those days for noticing the moon; evidently this didn't necessarily mean observing it. It's tempting to make more of these small inaccuracies than they probably merit: to be struck by the mixture, in Charlotte Brontë, of very close observation - we have just read the wonderful description of pine-tree debris clotted together by frost - combined with a certain proud inattentiveness to fact. It's no wonder to be ignorant of the moon's movements, but it does seem remarkable for someone to be so aware of the moon as a mobile creature and yet not to know its patterns. And I can't resist connecting this with how long the author had been satisfied with her Angrian settings of a Yorkshire landscape in Africa, in total defiance of what we suppose she must have known of African climates. Naturalism was a cloak she learnt to put on, but her imagination was always busy with other things than naturalism.